When I was a teenager, I enjoyed Victoria Holt’s gothic historical romance novels. At some point, however, I felt that she was just churning books out, so I quit reading them. When I ran across The Black Opal in a used book sale, I decided to see what I think of her now. Carmel was found as a baby under an azalea bush at Commonwood House, owned by the Marlines. She is believed to be a gypsy child. Although Mrs. Marline wanted to send her to a foundling home, Dr. Marline insisted on keeping her. So, she stayed in the nursery with the Marline children, although she was not treated like the others. Mrs. Marline’s brother, Toby, captain of a sailing vessel, is one of the few people who are nice to Carmel. Another is Miss Carson, the governess. Things begin to improve for Carmel when she meets Lucian and the other children at the Grange, a neighboring estate. But Mrs. Marline dies, and Carmel is thrilled to learn she is going on a voyage with Uncle Toby to Australia. On the voyage, she learns something about her parentage. When they arrive there, they get news that the Marline household is broken up. There is nowhere for Carmel to return to, so she stays with Uncle Toby’s wife. Ten years later, Carmel returns to England. There she finds that more was involved in Mrs. Marline’s death than she knew. There was a tragedy, and Carmel believes an injustice was done. She decides to find out what really happened. I remember Holt’s books as being fairly tightly plotted, but that was not the case with this novel. It is all over the place. Although the earlier scenes when Carmel is a child are necessary to the story, the scenes in Australia seem unnecessary, as if they are needed for padding. Characters are poorly developed, and some characters seem to fill no particular function. Maybe some of Holt’s earlier novels are better. It’s hard for me to say at this distance of years. But there are better gothic romance novels around. This one seemed to be about 100 pages of novel expanded out to nearly 400. The Forgotten Room is a romance novel, which is not my genre, but it has enough of a focus on family secrets to keep my interest. The novel relates the stories of three romances, set at different times in the same mansion in New York. Written by three romance authors, I suspect that each one wrote one of the stories. In 1892, Olive Van Allen is employed in the house as a servant, but she is there under false pretenses. The owner of the house, a nouveau-riche businessman named Pratt, hired her father as an architect for the house but then ruined him by refusing to pay him. Olive hopes to find paperwork to prove Pratt owed her father money, but she is distracted by falling madly in love with one of the sons of the house, the artistic Harry Pratt, and stealing meetings with him in his attic studio. In 1920, Lucy Young takes a job as a secretary at the office of Cromwell, Polk, and Moore, a law office that handles the affairs of the Pratt family. She also takes a room in a boarding house that used to be the Pratt mansion. In addition to the desire for advancement, Lucy hopes to discover in the Pratt papers the connection between the Pratts and her mother and perhaps learn why her mother whispered “Harry” on her death bed. Lucy is also soon torn between two men, her boss, Philip Schuyler, and a handsome art dealer from Charleston, South Carolina, John Ravenel. In 1944, Kate Schuyler is a doctor serving in a hospital that used to be the Pratt mansion. She gives one of her patients, Captain Cooper Ravenel, her own room in the top of the hospital because the hospital is overcrowded. But she is surprised when Captain Ravenel seems to recognize her and calls her Victorine. The pleasures in this novel came from trying to figure out how these people are related and what happens to Kate’s mother and grandmother. The tension is supposed to come from whether Kate will be parted from Captain Ravenel, who is engaged to be married to someone else. There’s not much doubt about that, though, and it’s more interesting to find out what secrets kept the other lovers apart. Unfortunately, Olive’s story is based on something a few words could have cleared up and the spitefulness of Prunella Pratt, Harry’s sister. Lucy’s is a little more understandable. What I found unlikely was Prunella’s conversion at the end of the novel to an old lady who regrets her actions and encourages Kate to follow her heart. Yeah. 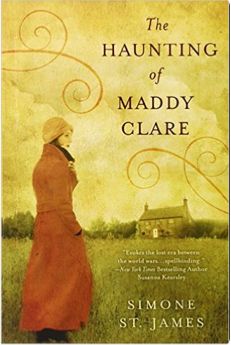 The Haunting of Maddy Clare has been on my reading list for a while. I’ve finally read it, and my first reaction is to immediately look for another book by Simone St. James. It’s not often I encounter a good ghost story. This one is really good. 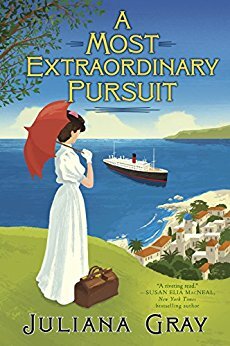 It’s just after World War I, and Sarah Piper has been living a safe but impoverished and lonely life in London taking temporary secretarial jobs, when her agency sends her to Alastair Gellis. Gellis has an unusual request. He is a wealthy young man who can afford to turn his interests into employment, and his interest is in ghosts. Alastair’s regular assistant is away, and he has been summoned to the site of a haunting. Sarah’s job is to assist him in recording evidence of a ghost. Maddy and Alastair travel to Falmouth House and an interview with Mrs. Clare, an elderly woman. She explains that Maddy came to her doorstep years ago as a child. She had been beaten and was barely dressed and covered with mud. She could hardly speak. The Clares took her in and tried to find her people, with no success. She was obviously of the servant class, so they employed her as a maid. She was with them for several years, always frightened and never leaving the house. Then one day she hanged herself in the barn. Maddy haunts the barn, and Mrs. Clare wants Alastair to get her to leave. She already tried an exorcism, with terrible results. But Mrs. Clare says that Maddy hated men, which is why she asked Alastair to bring a woman. Sarah learns she is expected to go into the barn accompanied only by a wire recorder and a camera. She finds the experience terrifying. Although she does not see Maddy, Maddy plants images in her mind and asks Sarah to find someone. What she wants is not clear, but Sarah decides to continue. Shortly thereafter, Alastair’s partner Matthew Ryder arrives. Although he is badly scarred from the war, Sarah is immediately attracted to him. Matthew, on the other hand, thinks Sarah is too fragile for the work and should be dismissed. In the meantime, Sarah has sensed a threatening presence in the village. This novel drags you in from its first sentences. It also tells a deliciously creepy yet heart-rending story about why Maddy is haunting the barn. 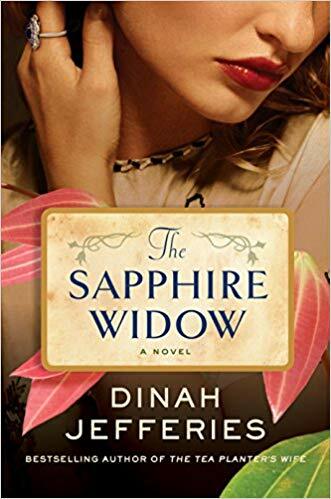 If you like ghost stories and enjoy some romance in your historical fiction as well, you’ll like this novel. Since she was a little girl, Azuba has wanted to marry a sea captain and leave her home on the Bay of Fundy to live with him at sea. Although such arrangements are not usual, they are also not unheard of. She envisions a life of romance and adventure, traveling to the distant realms of the earth. This is the life she plans with her suitor Nathaniel Bradstock, but once they are married, he changes his mind. Azuba is bored and discontented at home for years alone and feels he will be a stranger to their daughter Carrie. After a traumatic miscarriage, she decides to insist he take them with him on his next voyage. In her loneliness, Azuba has befriended the young Reverend Walton. Just before Nathaniel is due to return, carelessness and misjudgment result in a scandal for the two of them. When Nathaniel learns about it, he decides she cannot be trusted home alone and makes immediate plans to leave instead of staying ashore awhile as planned, taking along Azuba and Carrie. Azuba has got her way, but she is not happy. Aside from the misunderstanding with her husband, she has not realized the dangers and inconveniences of the voyage. To make matters worse, Nathaniel sees her and Carrie as more burdens among the many he must juggle as captain. The terrifying voyage around the Horn is the first in a series of mishaps that endanger them all. 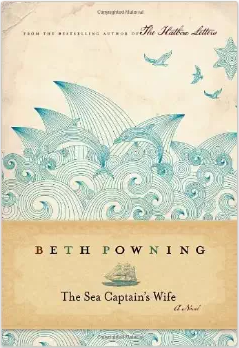 I found this a fascinating book in its knowledge of sea lore and the ports of the time. The main characters are complex, the novel focused on Azuba and Nathaniel’s struggle to design the conditions of their marriage. I have one plot quibble when Mr. Walton reappears in Belgium, where he is studying to be a photographer. After booking Azuba and Carrie on a relatively safe journey home by steamship, Nathaniel suddenly decides to keep them with him. There is no explanation of this decision, and we don’t even see the scene where it is made. It seems awkward, as if Powning made the decision just to further the plot. Finally, Nathaniel and Azuba don’t actually work out their conflict. Instead, the decision that resolves it is forced on Nathaniel. Still, I found this novel of absorbing interest. But one more quibble. Sometimes stopping to explain what Azuba or other female characters are wearing actually interferes with the story-telling. Rachel Woodley has been working in France as a governess when she receives a telegram informing her that her mother is ill. Although she returns home immediately, the telegram was delayed, and she finds her mother dead, the funeral over, and the landlord giving her two weeks to vacate her home. While she is going through her mother’s things, she finds a recent newspaper photo of the Earl of Ardmore with his daughter, Lady Olivia Standish. The Earl looks exactly like her father would have looked had he not died on a botanical expedition when she was four. But it’s not just a resemblance. He is the same man, with the same scar on his face. Rachel goes to Oxford to see her Cousin David, who she’s sure would know the truth. David explains that her father was the second son and that he and her mother were forced to part after her father’s older brother died and her father became heir to the estate. Rachel is furious to hear that her father left them, that she has been lied to, and that she is illegitimate. The thought of all the times she missed her father also makes her angry. She is expressing her displeasure when they are interrupted by Simon Montfort, Cousin David’s neighbor in rooms. He takes Rachel away to calm her down. Although Simon is a social columnist for the Daily Yell, he promises to keep private what he has overheard. Soon, he is helping her get an opportunity to meet her father. After a makeover of a new haircut and his sister’s fashionable clothes, he lends her his mother’s apartment and presents her to young London society as the chic Vera Merton, his cousin. Rachel is not entirely sure of her own motives but is soon positive that Simon is doing this for his own purposes, especially when she learns her sister Olivia was once his fiancée. 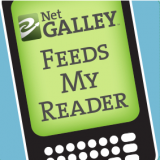 This novel is sheer frivolity, set as it is in the 1920s among the wild young things. It is certainly a bit predictable—soon we guess Rachel will end up with either her sister’s current fiancé or her previous one. But it has lots of snappy dialogue and enough twists to keep things interesting. 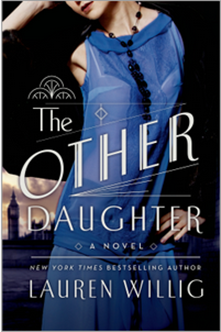 Although I’m not generally fond of this genre, I enjoyed The Other Daughter.